With zero mandate, SAS allegedly "hunts for WMDs" as West attempts incremental intervention at any cost. August 26, 2012 - The British Daily Star has reported in their article, "SAS HUNT BIO ARMS," that, "nearly 200 elite SAS and SBS troops are in or around Syria hunting for Assad’s weapons of mass destruction." The Star also claims that the SAS are accompanied by British MI6, US CIA, and both French and American soldiers. This after US' Barack Obama made comments claiming the US would military intervene if Syria so much as "moves them [unconfirmed WMDs] in a threatening fashion." Like Iraq, the West has provided no evidence that such weapons even exist, let alone prove that the weapons have or even would be used against terrorists operating across Syria. And like in Iraq, another false pretext is being developed through leaks, and limited hangouts in an attempt to prime the public for a desperate intervention designed to bolster the West's collapsing terrorist front. The West also categorically lacks any semblance of an international mandate to act militarily within Syria - meaning that if SAS soldiers are in Syria, they are in egregious violation of international law. Should chemical weapons "move" or be "used" in Syria, it will be in the form of a false flag attack, with weapons brought in by Libyan terrorists now confirmed to be leading the so-called "Free Syrian Army" with US, UK, European, and Gulf State weapons, cash, and logistical support. US, British, French, and Gulf State-backed Al Qaeda militants have been attempting to infiltrate and violently overthrow the government of Syria, as well as terrorize the population into submission in a brutal, year and half long terror campaign. In July and August, NATO-backed terrorists attempted to seize Syria's two largest cities, Aleppo and Damascus only to be dealt severe losses and a rebound of Syrian forces enjoying increasing public support for ending the violence. 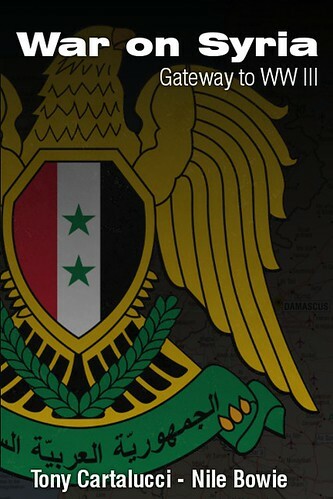 For more news and information on Syria, please visit Land Destroyer Report's Syria news archives.